I have never been the long-distance bike riding type. The spandex thing is silly, the leg shaving too high maintenance. Instead I have taken a utilitarian approach to two-wheeled self propulsion. In many instances it is just the easiest way to get around. But I have begun to notice that the more I ride the more I enjoy it just for the sake of riding a bike. Turns out it is pretty fun. On Sunday I rode around Mercer Island for my first time. Though the ride was about 16 miles, I was having so much fun, that it felt like 5. Big water and mountain views, few cars (except for noisy I-90), tall trees, cool air, good company. I will map it next time for those who have yet to try it. But today’s post is about something else altogether great: Pizza! Things are abuzz on Beacon Hill about the new bar at the old ROCKiT space and the Bar del Corso Pizza spot. Pizza bar and beer bar, yum! 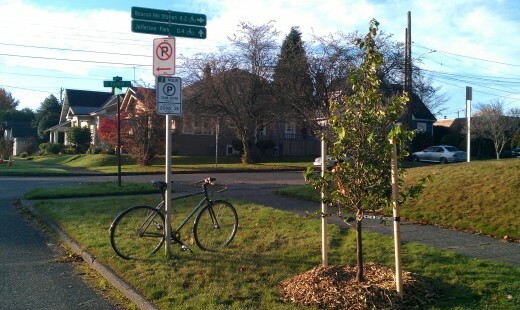 Both these spots will be along Beacon Avenue and easily accessible by foot and bike, especially if you use the newly proposed bike boulevard along 17th/18th ave. But alas, we must wait months for this fun to start. So until then, here is a safe route to the very near and very delicious Mio Posto in Mt Baker. This spot is great for its Irwin’s Pastries and brick oven pizza! If you are looking for something a little different try this safe route to All Purpose Pizza in Leschi. They serve a Pagliacci-esque pie with a smile. After all this pizza you will need that ride to Mercer Island to clear the arteries, but don’t worry, it goes by in a flash. Now that the holiday season is upon us, shopping is on the minds of many. Black Friday is infamous for the crushing crowds at the box stores and the malls and now “Cyber Monday” has become a major phenomenon, as folks turn to the internet for convenient holiday shopping. Both these forms have shopping have something in common: they do not support local businesses. On Beacon Hill this is a chicken and egg issue—not much holiday shopping occurs locally because there are not many places to shop, and there are not many places to buy gifts because people tend to drive elsewhere to do their holiday shopping. But it was not always this way. 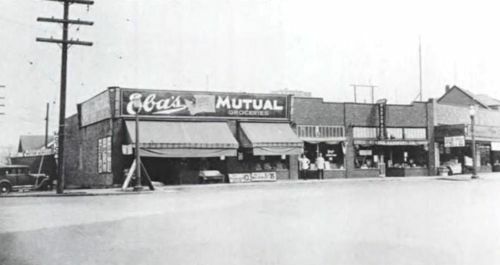 In 1937, the east side of the 15th and Beacon Junction, now home to the ABC Supermarket and the big empty building that is Hui Intertrading, was home to Eba's Mutual Grocery, Ray's Barbershop, a hardware store, and a small Safeway. 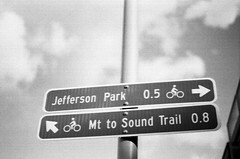 Photo from the Puget Sound Regional Archives. Biking was also popular before the War, as evidenced by the fact that a popular bicycle repair shop (Mr. Ellis’s Repair Shop) used to exist on Beacon Avenue at the current location of La Bendicion. Because it was difficult to get off the Hill by foot, bike, or long street car ride, people stayed up here to do their shopping and the local economy boomed. Today, the Department of Planning and Development‘s answer to bolstering the local economy is density and transit oriented development. Generating more shoppers will help, but just as important is to reorient existing residents inward. One way of doing this is changing how we get around. So before I walk up to Red Apple to get some groceries, and El Centro to pick up my Christmas tree, I thought I would share another quasi-local route to a great shopping destination that is fun for the whole family: Goodwill! 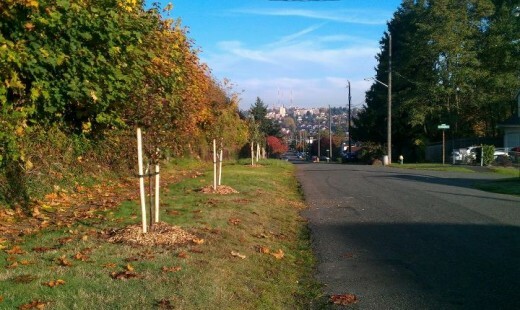 This route is safe for bikers of any level and because it uses 18th Avenue South to get back up the hill, it is not too strenuous. I look forward to the days when I can stay on the Hill to do all my shopping; until then, I have my bike as a viable transportation alternative that forces me to keep it local (and keeps me from getting trampled trying to pick up a NERF N-Strike™ Stampede ECS™). Happy Holidays and please respond with your favorite local shopping destinations! 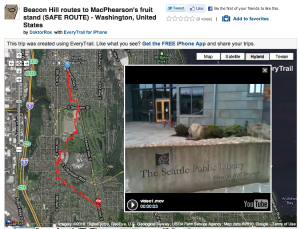 Map on Everytrail website, showing safe bicycle routes to MacPherson's produce market. The map includes videos with commentary about the route and reasons why certain paths were chosen. Beacon BIKES! is excited about our upcoming community-wide biking and walking information event on Saturday, November 20 (at Beacon International School, 2021 14th Avenue South, from 10:00 am until noon)! To celebrate biking as a viable option on Beacon Hill and in Seattle in general, I thought I would show how safe and easy biking can be in and around our neighborhood. Many years ago I lived in Davis, California, which is known as the biking capital of the U.S. (Their city logo is even a bike!). In Davis, biking is just the easiest way to get around, not only because it is a dense city and flat as a pancake, but because there is an amazing bicycle infrastructure to keep biking safe for everyone. As a result, 17 percent of the population commutes by bike (compared with the less than 3 percent in Seattle). I bring up Davis because what is interesting to see is that when that many people are biking, they stop identifying as cyclists—they are just people who happen to get around town in the easiest manner available, by bike. So that is our goal at Beacon BIKES!, to make biking so safe and easy that even your grandma will want to hop on a bike to head to MacPherson’s for her afternoon errands. We are not a bunch of spandex-clad aggro bike advocates, but rather neighbors who want to see you on the streets walking or biking to your local destinations. If we get out of our cars (and yes, we all have cars too) more often, our options for what are viable trips change and we become more neighborhood-oriented. We go to Red Apple instead of Safeway, The Station instead of Starbucks, and we see our neighbors along the way! Part of what we will be doing on the 20th is providing maps for safe routes to schools (and other destinations) for you and your children on Beacon Hill. We will have a bunch of blank maps; you show us where you live, and we draw you a safe route to your destination of choice. In the spirit of this, I have begun to compile a series of virtual tours of routes that I use to safely get around and off of Beacon Hill, both by myself and with my family. All the routes I map either start or end at the library or light rail station. I also frequently take advantage of the light rail to get back up the hill after biking off the hill. I have more routes already mapped and more planned for future posts. In the meantime, let me know the destinations you would like mapped in the comments section. Happy Biking! See you on Saturday! On July 7, Mark Holland and I (representing Beacon BIKES) met with Seattle Department of Transportation (SDOT) and Sound Transit to discuss options for improving the pedestrian crossing in front of the light rail station. As it currently stands the crossing is not very safe. The crossing distance is very long, people do not use the crosswalks, traffic moves too fast, and the bus stops complicate the foot and vehicular traffic patterns. Add to this the surge of people coming from the light rail station and we have an accident waiting to happen. You can see a previous post about the dangers of the crossing here. Sound Transit was planning to repave the section of Beacon between McClellan and Lander without improving the pedestrian crossing. Beacon BIKES got wind of this and arranged a meeting to discuss options for pedestrian improvements as part of the repave. SDOT was instrumental in setting up the meeting and convincing Sound Transit that this crossing needed to be improved (Thanks Sam Woods!!). Based on our meeting SDOT came up with the following design. The SDOT draft plan for Beacon Avenue. Click the image to load a larger, more-readable PDF of the plan. The major features of the new design are a planted median, widened crosswalks at either end of the block, and narrowed travel lanes. The narrowed lanes would mean that buses stop in lane. In lane bus stops are being implemented all over the city as a means of speeding up the bus system. The median would have a tasteful barrier down the middle so people could not stream across the street at mid block. Instead, they would be directed to the wide crosswalks at the corners to cross. With the widened sidewalks the crossing distance would be shortened making for a safer pedestrian experience. The design that Beacon BIKES put forward did not have in lane bus stops but did include a raised crosswalk at mid-block. Our logic here was that everyone wants to cross at mid-block to get to the bus, so why not give them an avenue to do that instead of forcing them around (also the raised crosswalk would act as a speed table and slow traffic down). SDOT did not like the mid-block crossing idea because of the relatively short distance between McClellan and Lander, but we are still hoping they will reconsider. As is apparent from the rough nature of the design sheet, the plan is not finalized, so this is your chance to come up with an inspired idea that will make this pedestrian crossing safe and inviting while still accommodating bus, bike, and vehicle traffic. In the meantime check out Beacon BIKES on Facebook, and come to our next meeting to join the fun. The meeting is on Monday, November 15, at the Beacon Hill Library, 2821 Beacon Avenue South.